Harley-Davidson Laconia | Throttle Life! Harley-Davidson is moving to the heart of the Laconia Motorcycle Week® action with a new Weirs Beach venue that will be open for the duration of The World’s Oldest Motorcycle Rally, June 10-18, in scenic New Hampshire. For the first time in years, all Harley-Davidson exhibits, events and free demo rides on new Harley-Davidson® motorcycles will be conveniently located directly across the street from the entrance to the drive-in across from the Weirs Beach landmark sign on Endicott Street North. 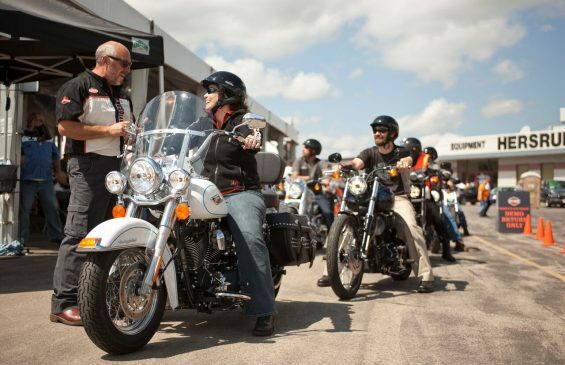 For complete information on Harley-Davidson activities and events during Laconia Motorcycle Week visit h-d.com/laconia. Motorcycle demos: See and ride new 2017 Harley-Davidson models including the just-released Street Rod® plus the new Road King Special® and other Touring models powered by the potent new Harley-Davidson® Milwaukee-Eight™ engine. The demo fleet also includes the nimble Harley-Davidson Roadster model, fabulous 2017 CVO models and bikes fully customized with Harley-Davidson Genuine Motor Accessories. New Milwaukee-Eight Display Truck: Experience the all-new Harley-Davidson® Milwaukee-Eight™ engine through technical displays (June 12-18) and feel the rumble of this exciting new V-Twin on the Harley-Davidson® JUMPSTART™ Rider Experience. Check out the customized Harley-Davidson Rebel Freightliner truck and a display of new items from Harley-Davidson Genuine Motor Parts & Accessories. See It/Try It/Buy It: Test out new Harley-Davidson helmets and riding gear when you demo-ride a bike. Laconia Harley-Davidson will offer a selection of new Genuine MotorClothes for purchase on site. H.O.G. Pin Stop at Laconia: Join Harley Owners Group (H.O.G.) staff members at the Harley Headquarters and pick up a cool pin (exclusively for H.O.G. members). Join Harley Owners Group (H.O.G.) staff members at the Harley Headquarters and pick up a cool pin (exclusively for H.O.G. members). Be sure to follow Harley-Davidson on Facebook to join in the action, daily videos will post to check out all the activity virtually.